Hello, my beautiful friends! Hope you all are well and packing your backpack for the next trip. 🙂 Today I will share with you some trip-tips for your health while you’re traveling. I sorted out some tips How To Be Fit During The Travel Time. So let’s see what are they! Fitness and healthy eating is the new way of lifestyle. Everyone loves good body and healthy eating habits. We love our fitness routine. Gyming, exercise and yoga became a part of our life. We all want to eat healthy food. But it all go mess or over looked when we are travelling .we don’t have our own space to look after fitness . Today I am going to share with some easy and fun ways to keep check your fitness while traveling. You don’t need to take your whole fitness and gym with you. But you can maintain everything some easy and simple way. 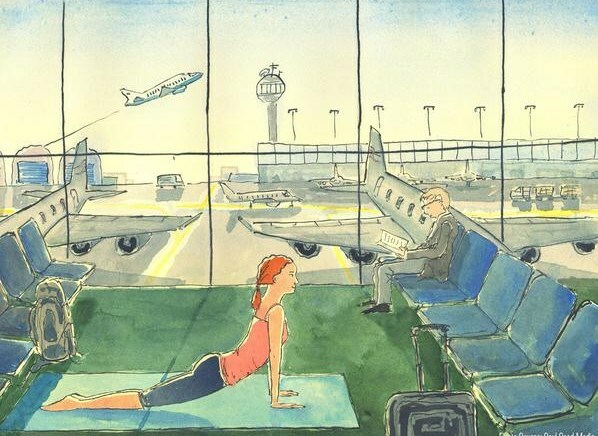 Yoga is an easy and effective way to keep yourself active and fit while travelling. You don’t need too many equipment to do yoga. Just your fitness gear, yoga-mat and your fitness tracking watch (if you use) plan your day and make a little time of 15- 20 minutes in the morning to do yoga. It will make you feel and fresh all day. So you can enjoy your day! Walking is also a great way to keep your fitness. Take a walk to your site or do some hiking. Leave your motorbike to go to nearest place. Walk it around. Getting healthy food in unknown places is a serious issue. Pack some granola bar, protein supplement, some nuts or healthy option according to your liking. It will ditch those snack craving or starve which leads to unhealthy foods. Leave the lift and do the staircase. It’s really work for your whole body and make you really fit. But if you’re a patient of heart disease then be careful of take consultancy of doctor. Take your own bottle with you for water. I know it sounds silly but it helps you in keep yourself hydrated when roaming around city siting or in making a protein or energy shake on the go. Stretching is a good way to release your tighten muscles and make it feel lightly. Hand and legs stretch are easy to do and they provide get results. Make a plan of where you are visiting, where you are going to stay, what are options around it. It will help in planning your routine. I know we all can make plans, how to do, how it should be done but sticking to it the main problem. Make a plan and stick to it. These are all the basic and easy way to keep yourself fit and it doesn’t need any arrangements. Just a little change in your packaging and planning and your fitness is sorted even when you are on trip. So, whenever you are planning or going to make a plan do check out this easy way to keep yourself fit while travelling. You can visit my blog if you like this article. And don’t forget to like, comment and share.